It's All About Heart, is perfect for Diveheart in 2018. We could not do anything without the giving hearts of our volunteers, the intrepid hearts of our participants and the generous hearts of our donors. All these hearts come together to help Diveheart change lives for the better and allow people with disabilities Imagine the Possibilities in their lives. We've seen magic happen time and again throughout the 17 years we've been in existence, be they first timers at one of our pool programs or long time adaptive divers who join us on a trip. We meet people who are told, "You can't do that." and show them that they can! On many levels we give them freedom. 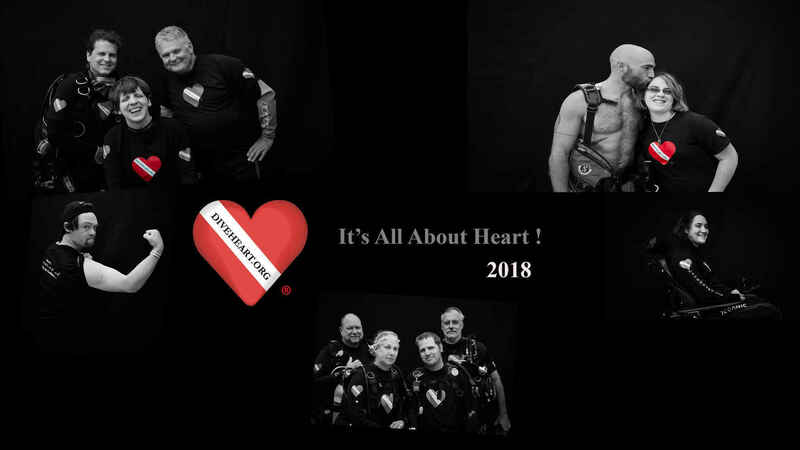 Let's not forget our adaptive buddies and adaptive scuba instructors who tell us all the time how working with Diveheart adaptive divers enriches their lives beyond count. Through your support we can continue to see magic happen for people of all abilities in new places, expanded programs and more trips! Nephew picked DiveHeart as his favorite charity for us to give a gift in his name too. We are honored that you shared this incredible organization with us. We hope the purchase of the dive masks gets you closer to your goal. Thank you! In honor of my father, Ron Sams, a new master diver and retired Air Force Lieutenant General. Jim, Keep up the great work. Happy to see you in Costco Magazine. Happy diving and thank you for your service!